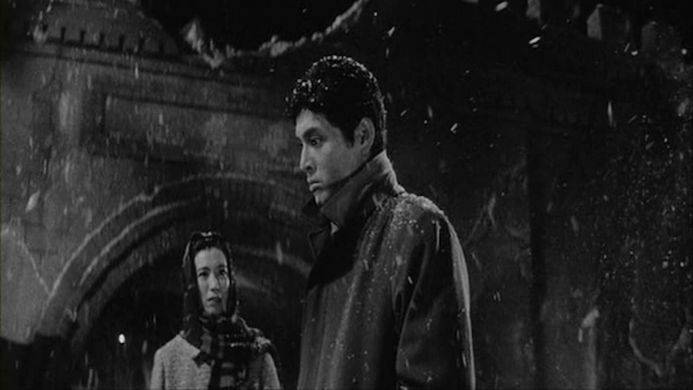 Set in 1959, “No Greater Love” is the first part of Masaki Kobayashi’s epic trilogy “The Human Condition”. This first part follows Kaji (Tatsuya Nakadai), a young man who is sent out to Japanese-occupied Manchuria in 1943. His job is to oversee the iron-ore mining operations. He travels to China with his wife Michiko (Michiyo Aratama) and soon comes up against fierce resistance in his attempts to improve the conditions of the workers. Despite his colleague Okishima (So Yamamura) being sympathetic to his aims, the foremen of the mines, in particular Okazaki (Eitaro Ozawa), treat him with contempt believing him to be weak. When the military police send hundreds of prisoners to be put to work, Kaji is left in charge of the men and tries to help them despite their distrust of the Japanese and repeated escape attempts. “The Human Condition” is based on a novel by Junpei Gomikawa with a screenplay by Zenzo Matsuyama and director Masaki Kobayashi. The story is epic in scale, but manages to keep its central plot personal. Beginning with Kaji and Michiko, they act as a focal point for the horrors that are happening around them. Kaji represents the viewer in his disbelief and disgust at what he finds in Manchuria. But despite his best efforts he is unable to stop many of the atrocities. This creates a poignant narrative of humanity’s failure to effectively tackle its most vile elements. Despite a large cast of characters the film never feels overly complex, even when it comes to the escape attempts which involve a number of players on both sides of the fence. Likewise, the framing creates clear distinctions between characters and numerous moments of tension as their ideologies come into contact. This is most clear when Kaji faces off against the military police officers. The presence of the Japanese Imperial flag in the background in scenes where the characters actions may be immoral mark the film as a bold work. It is unsurprising that it had its critics on release due to an apparent anti-Japanese bias (in fact the film is staunchly anti-war, but this distinction may have gone unnoticed at the time). The production value is clearly high and the sets and number of extras create a sense of realism that helps the film achieve a greater impact. The brutality is largely only alluded to until the final third of the film. This creates a sense of tension and foreboding that something terrible will happen. Chuji Kinoshita provides a suitably epic score and the cinematography by Yoshio Miyajima is exceptional. The film is a startling criticism of Japanese militarism and a rebuke to nationalist sympathies. It shows the Japanese occupation of Manchuria as cruel and the inhumane treatment of their prisoners who were put to work in the mines. Racism is rife, with the Japanese looking down on the Chinese locals. The inclusion of “comfort women” and enforced prostitution in the film also exposes a part of history that many would rather keep hidden. The women are given a strong voice through the character of an unwilling prostitute used by the Japanese forces and their captives. She states explicitly that they are as much prisoners as the men who are kept behind the barbed wire fences. They have no freedom to choose. The film shows the most despicable side of human nature, one that is cruel and discriminatory. However, it balances this by including the love story between her and one of the prisoners. There is a frail sense of hope that love can blossom even in adversity. In the end, Kaji feels that he has failed. Not because he participated in the violence, but because he allowed it to happen. Kaji’s pacifism and humanism are a constant cause of scorn for his fellow men, who believe this to be a sign of weakness. However, as the film progresses it becomes clear that he has chosen by far the more difficult path, to espouse peace and care for his fellow men when all around him are violent.